One of the thing that stands out to us as problematic when encouraging our species and societies to have balanced views about psychoactives, and is part of the reason that the public policy is a rolling global disaster, is that most data published about harms is selectively chosen for greatest impact. It is unfortunately, from our view, that they did not also then include in their analysis presentations related to pharmaceutical drugs, but this is a great start. Their summary speaks for itself, but imagine a world where all major hospitals published anonymized case data and we could get this type of summary every year?! It’s just too much to imagine that we might base education, expectation, and public policy on real world understandings of that relative magnitude of harms, rather than the most recent scary news story or the grieving parents of a tragic fatality. Their paper is not as extensive as it could be and we’d really like to see a matrix table of what drugs were found combined with other drugs. Also, the authors did not have the ability to detect or identify new synthetic cannabinoid receptor agonists. About a third of the cases were “related to” cocaine and a third “related to” cannabis. The next most common self-reported substances were heroin, benzodiazepines, MDMA, amphetamine/meth, unknown, and then opioids (excluding heroin and methadone). Perhaps the biggest question is how good their detection / analysis is. Would they be able to detect MXE or deschloroketamine or other really new substances if they had been present? Although the recreational use of psychoactive substances is common there is only limited systematic collection of data on acute drug toxicity or hospital presentations, in particular regarding novel psychoactive substances (NPS) that have emerged on the illicit market in the last years. We included all cases presenting at the emergency department (ED) of the University Hospital of Basel, Switzerland, between October 2014 and September 2015 with acute toxicity due to self-reported recreational drug use or with symptoms/signs consistent with acute toxicity. Intoxications were confirmed using immunoassays and LC-MS/MS, detecting also novel psychoactive substances. Among the 50’624 attendances at the ED, 210 were directly related to acute toxicity of recreational drugs. The mean patient age was 33 years and 73 % were male. Analytical drug confirmation was available in 136 cases. Most presentations were reportedly related to cocaine (33 %), cannabis (32 %), and heroin (14 %). The most commonly analytically detected substances were cannabis (33 %), cocaine (27 %), and opioids excluding methadone (19 %). There were only two NPS cases; a severe intoxication with paramethoxymethamphetamine (PMMA) in combination with other substances and an intoxication of minor severity with 2,5-dimethoxy-4-propylphenethylamine (2C-P). The most frequent symptoms were tachycardia (28 %), anxiety (23 %), nausea or vomiting (18 %), and agitation (17 %). Severe complications included two fatalities, two acute myocardial infarctions, seizures (13 cases), and psychosis (six cases). Most patients (76 %) were discharged home, 10 % were admitted to intensive care, and 2 % were referred to psychiatric care. Most medical problems related to illicit drugs concerned cocaine and cannabis and mainly included sympathomimetic toxicity and/or psychiatric disorders confirming data from the prior year. Importantly, despite the dramatic increase in various NPS being detected in the last years, these substances were infrequently associated with ED presentations compared with classic recreational drugs. After a phone call with an expert earlier this month where Earth was reminded how few people understand the more technical options in the Experience Vaults, we decided to try adding a button to the bottom of search results and lists to show Cellar reports. Before this week, the “Show Cellar” button only showed up if there were no reports matching a given search. There has always* been an Advanced Search option to include Cellar reports in a search, but very few people used this option. We’re not 100% certain this is a good idea, because we don’t want to highlight Cellared reports too much. We don’t want to shame authors for writing reports our triagers and editors consider below our cutoffs, nor do we want people to have to slog through reading reports that are considered to contain data but have some serious problem that caused them to be relegated to the Cellar. The filename for that image on their site is “K2-BusShelter” and the campaign is designed to be seen by the general public in the United State’s largest city. As we call it, the United States’ only Real City. Everyone would rather have young people smoking pot instead of waxy solid research chemicals from China. Everyone. The threat of synthetic CRAs being a replacement drug for cannabis is so frightening, it is part of the pressure that has moved us to the point where cannabis legalization is pretty much a done deal in the US. The disaster that is prohibition can take full ownership of the dangers that the city of New York warns people about here. And, of course, the synthetic cannabis replacements are often far more illegal to possess than plant cannabis. NYC technically decriminalized marijuana in the 1970s. In 2016, cannabis possession for personal use 25g or less is a “violation” / infraction — a ticketable offense with a fine between $100 and $250. Since it’s not a legal ‘crime’, being caught with cannabis does not trigger most of the negative social and legal repercussions of ‘drug crimes’. 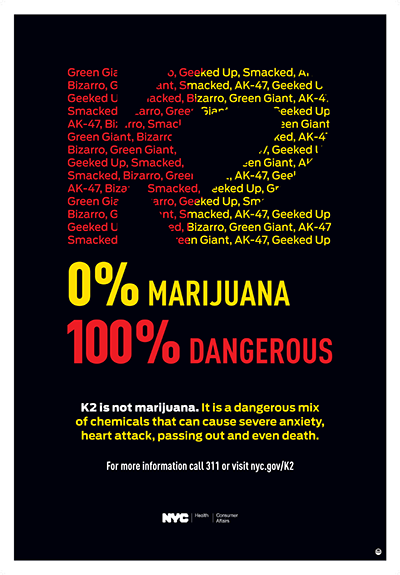 K2 is 0% marijuana and is 100% dangerous. Since 2015, there have been more than 6,000 synthetic cannabinoid-related emergency department visits in NYC. Males account for approximately 90% of these emergency room visits. Death is a rare but serious risk associated with the use of K2. In New York City, there have been two confirmed deaths caused by K2. Since the chemicals found in K2 vary from packet to packet, and potency can differ even within one packet, the effects of K2 are unpredictable. People who use K2 may feel fine one time, and become extremely sick the next. Regular users may also experience withdrawal and craving. Some of the adverse health effects of using K2 include: extreme anxiety, confusion, paranoia, hallucinations, rapid heart rate, vomiting, seizures, fainting, kidney failure, and reduced blood supply to the heart. If you see anyone who is unconscious, unresponsive, or experiencing a seizure, call 911. What are synthetic cannabinoids (K2)? Synthetic cannabinoids are a class of compounds designed to mimic the action of 9-tetrahydrocannabinol (THC), the primary psychoactive constituent of marijuana. But, K2 is not marijuana. Many different synthetic cannabinoids can be manufactured. The chemicals involved can cause unpredictable and dangerous effects, detailed below. It is sold as incense, herbal mixtures, or potpourri with a variety of names including, but not limited to “Spice,” “Mr. Nice Guy,” and “Green Giant” It often carries a warning that the products are “not for human consumption”. An expanded list of product names can be found on the next page. What are the dangerous effects of K2 use? The most common adverse effects that have been reported include lethargy, confusion, drowsiness, respiratory depression, nausea and vomiting, tachycardia (increased heart rate), paranoid behavior, agitation, irritability, headache, seizures, and syncope (loss of consciousness). Severe side effects may include acute renal failure and significant negative effects to the cardiovascular and central nervous systems. In rare instances, use of synthetic cannabinoids has been linked to death. What is the legal status of K2 in New York State? It is illegal in New York State to possess, sell, offer to sell, or manufacture synthetic cannabinoids. Stores in possession of synthetic cannabinoids can be fined $250 per packet. Additionally, continuing or repeat violation may result in closure of the retail establishment and entities and persons who have been ordered by the DOHMH to stop selling synthetic cannabinoids risk additional civil and criminal penalties if found to have them. Who has experienced negative health consequences? In New York City, males account for 90% of K2-related emergency department visits. Patients have a median age of 37 and 99% of the patients are age 18 or older. There has been a rapid and significant increase in K2-related emergency department visits in New York City. These substances have the potential to be extremely harmful due to their severe adverse effects and a mistaken belief that they are a safe, legal alternative to marijuana. How may I contact the Poison Control Center? The Poison Control Center can be reached at (800) 222-1222 or by calling 311. How can I report a store that is selling these products in New York City? Call 311 to report retailers that are still selling these products. The Dutch drug testing program does not allow for mailed-in samples (folks have to bring them in person) and they never publish individual results publicly, nor do they publish summaries contemporaneously. Only warnings about “dangerous drugs” are published soon after a sample’s analysis. Despite these limitations, the Nederlands Ministry of Health’s Drug Information and Monitoring System (DIMS) is one of the best testing projects in the world. The DIMS Annual Report for 2015 says the project analyzed nearly 12,000 samples in 2015 alone. Their program works by individuals bringing samples in to one of the approved locations, in person. In some cases (like with pharmaceutical tablets) the drug identification is provided immediately. In other cases (they do not specify frequency) they send the sample in to a lab and the individual who brought in the sample is given a unique code, which they can use to call back in a week and get the analysis result. They had an amazing 28 physical locations in 2015 in a country the size of Ohio. Free testing, in every major city and some minor ones. NOt more than an hour’s transit away. There’s nothing else like it. Fire had a dream last night where she went to a religious retreat that was oriented around “Sleep as Prayer”. Participants were required to sleep more than 12 hours, but could not stay in bed more than 16 “because it would attract the wrong sort”. In the dream, “Somnambulation” was the term that stuck in her head. Beds lined up like military cots. Fire and Earth were coming in late and had to pull a bed out lengthwise, we had to pull it out in order to get into our spot because there was no walking path without rearranging the beds. In what-seems-not-to-be-dream life, there is no question that we are believers in the Church of Sleep. Sleep cures physical and spiritual ailments of all sorts and scientifically brings us closer to the Atman / Buddha Mind. And, of course, the curious, dubious, yet telling world of dreams. While discussing epidemiology and drug policy with to an MD who works in the US federal government, he mentioned that he’s trained as a clinician, not in research. Do you know what doctors mean when they say “In my clinical experience…” ? When a doctor says “in my clinical experience…” that means they’ve handled one case related to the matter. If they say “in my long clinical experience” that means two cases. And if a doctor says “In case, after case, after case…“, that means three cases total. DEA Stopping Civil Forfeiture Against Cannabis Vendors? In very exciting news, it appears that the DEA may be backing off from their quasi-legal use of civil asset forfeiture for fighting against state and local differences in drug laws. Read about the news California Cannabis- Civil forfeiture proceedings against the nation’s largest medical marijuana dispensary halted – that Harborside, a major medical cannabis dispensary business in the Oakland, California area, has been fighting for years against forfeiture. Harborside is one of the few dispensaries Fire and I have toured the operations of and it has remained an important medical cannabis dispensary of the last decade. Civil asset forfeiture is a tragedy as it has been allowed to evolve in the United States. If you don’t know about it, very simply it’s the use of civil proceedings that do not require the “beyond a reasonable doubt” standards required for criminal prosecutions. The government (usually the police, DEA, FBI, etc) seizes assets with an accusation (not a conviction) that the assets were involved in criminal activity. It makes taking away people’s private property very easy compared to convicting someone of breaking a law. For years, the Drug Enforcement Administration has been using civil asset forfeiture and threats of forfeiture proceedings to try to keep local areas from changing drug laws. And to punish high profile individuals and businesses in state level cannabis policy change. In the main cases, property owners who rent their buildings to medical cannabis dispensaries in California or property owners who themselves are dispensaries have the DEA come in and try to have the ownership of the real estate or building taken away without any criminal court proceeding. It’s been a big deal, because most owners of buildings are not willing to spend millions of dollars on legal fees fighting the DEA to protect a medical cannabis operation. So this is one of the many quasi-legal bludgeons the federal drug police have been wielding against those who are complying with state, but not federal cannabis laws. OAKLAND, Calif. (AP) — Federal prosecutors have agreed to drop a nearly four-year effort to seize the property of a California medical marijuana dispensary billed as the nation’s largest, the dispensary’s attorney said Tuesday. The federal government’s decision to end the case against Harborside would be the second time in recent months it has backed off a California medical marijuana dispensary. Prosecutors dropped their appeal of a judge’s October ruling in a similar case against the Marin Alliance for Medical Marijuana. “We are beginning to see the beginning of the end of federal prohibition,” Harborside’s executive director, Steve DeAngelo, said. Posted on May 4, 2016 Author earthCategories Drug PolicyLeave a comment on DEA Stopping Civil Forfeiture Against Cannabis Vendors? A question came up yesterday about whether we need to add different dose information to our 4-Acetoxy-DMT Dose Page for different salts. Our team believes that the primary salt sold over the last fifteen years of 4-Acetoxy-DMT has been the fumarate salt (fumaric acid). If one assumed that each fumarate molecule paired up with one 4-acetoxy-dmt molecule in the salt form, then there would be about a 25% difference in the potency between the fumarate and the hydrochloride (HCl) salt. Some vendors have reportedly sold the HCl salt instead of the fumarate, and so this could result in a difference of potency between different pure salts of 4-acetoxy-DMT of about 25%. However, after consulting with some of our friends in the Erowid Expert Network who are senior analytical and synthetic chemists, they were able to confirm that the fumarate salt of 4-acetoxy-DMT is always diprotic, with some small technical caveats. So there’s only a few percent different in potency between the two. “USP Lysergic Acid Diethylamide Tartrate (LOT 1) Authentic Substance Recharacterized for Authentication of a House Supply of Lysergide (LSD) Tartrate”. . The paper demonstrated, via extreme drug geekery, that the two samples of pure, high grade LSD they had were not identical. In subjecting a commercial supply of lysergide (LSD) tartrate (Sandoz Lot 79001) to authentication for adoption as a "working standard", infrared (IR) proton nuclear magnetic resonance (1H-NMR) spectra of the working standard showed some dissimilar features to those obtained from the USP LSD Tartrate Authentic Substance (Lot I). Although comparable mas spectral results were obtained from the two LSD samples, further investigation by 1-H- and 13C-NMR spectroscopy showed the USP material to contain appreciable excess tartaric acid. So, according to our experts, fumaric acid is almost always diprotic, but one cannot be certain without actually verifying that with a given ‘freebase’ molecule. Caymen finally got deschloroketamine available as a standard recently, so we got some and were able to confirm that two previously unidentified samples were deschloroketamine. See EcstasyData 4350 and EcstasyData 4070.